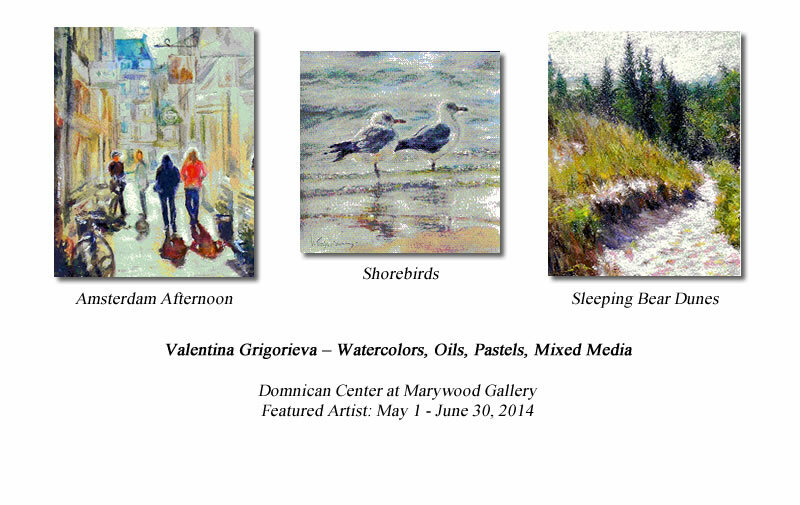 Dominican Center at Marywood Art Gallery will display the works of Valentina Grigorieva through June 30, 2014. Dominican Center at Marywood Art Gallery will display the works of Valentina Grigorieva through June 30, 2014. Most of the works are available for purchase. Valentina's paintings are personal reflections of her broad interests in subject matter ranging from cityscapes and landscapes, to flora and fauna. Although portraits of people are a favorite mode of expression, Valentina has a special love for abstract art. She works with a variety of different techniques and archival quality medias, but watercolor is her favorite because “it’s free and unpredictable, yet it is the most difficult media to work with”, as she says. Valentina is a member of Grand Valley Artist and River Town Artist of Grand Rapids. Her work has been successfully exhibited at several galleries and shows, including the West Michigan Regional Art Competition and Artprize. You can read more about our featured artist and view more of her works at the DCM Art Gallery. The Marywood Gallery is located in Dominican Center at Marywood, on the lower level of the main Marywood building at 2025 Fulton Street East. You can park for free in the large Marywood lot on the west side of Lakeside Drive, NE. The lot is about 1000 feet north of Fulton Street. (See map to free parking at right.) If you need more information, directions or details, please feel free to contact the DCM Front Desk at 616.514.3325. Monday-Thursday 8 a.m. – 9 p.m.
Friday 8 a.m. – 8 p.m.
Saturday and Sunday 8 a.m. – 6 p.m.
Come and meet the featured artist at a public reception that will be held on Sunday, June 8, 2014 from 12:00 Noon - 4:00 p.m. While you are here, stop in at the DCM Bookstore and browse through our wide variety of books and gifts, which are appropriate for all life celebrations and occasions. Sister Francetta McCann, OP, is the curator of the Marywood Art Gallery. She contacts selected artists and works with them to arrange the showing of work produced by Michigan artists. The show changes every two months, giving several local artists a venue to display and sell their artwork each year.